When you first enter Terraria it will be daylight. If you've come to Terraria from Minecraft, you probably think you're safe because the sun is up. There are monsters roaming the world of Terraria during the day. Thankfully, the ones you'll encounter when you begin a new game will only be green slimes. These slimes will attack by jumping at you, but they don't do much damage, and they're easily combated with the mining pick. Slimes are common, so stay alert. If you find that you're taking a lot of damage look for and pick up some mushrooms. These can be used to heal yourself. Although there are slimes out during the day, the real nasty stuff comes out at night. It's unlikely that you'll survive if you're caught out in the night with no place to hide, so you'll want to build a basic structure. In the long run the structures you build can attract NPC vendors that increase the items you have access to, but for now your main concern is to create something that will shelter you through the night. Wood is going to be your resource of choice. It's easily harvested with the axe you have when you start the game, and there should be plenty of trees nearby. Just walk up to one and start swinging. You're going to need a lot of wood to create a substanial structure, so keep going until you have about 100 or so. Once you've plenty of wood, lay down a floor of wood on the ground. You don't need a huge structure for your first night, so just lay down a row of twelve pieces of wood or so. Then build walls on either end of your floor and, of course, a ceiling. You'll now have a nice basic shelter that will at least keep the slimes from bothering you for a bit. So, you have two walls, a floor and a ceiling. That's good, right? Actually, no. You'll notice that while you have a shelter that slimes can't get in, the space behind your character is still blue sky. 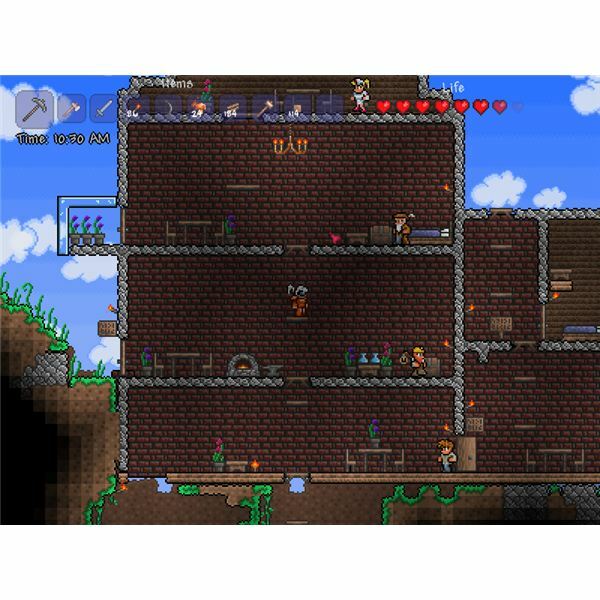 While Terraria is a 2D game, you're expected to complete structures by filling in them in with walls. If you don't do this, monsters can spawn inside your structure, which of course defeats the purpose of building it. You can't build wood walls without a crafting station called a Workbench, however, so go ahead and create one and place it inside your shelter. Then build wood walls and use them to fill in your structure until there is no longer any sky (not even a little bit) visible through it. Congrats! You're now safe from monsters. You're also trapped inside by the monsters, however, which means the game is going to be rather boring. Open up your crafting list while standing next to the Workbench and create a wooden door, then tear down one of your walls and place the door there. Finally, create some torches and put them inside your structure so that you'll be able to see when darkness falls. 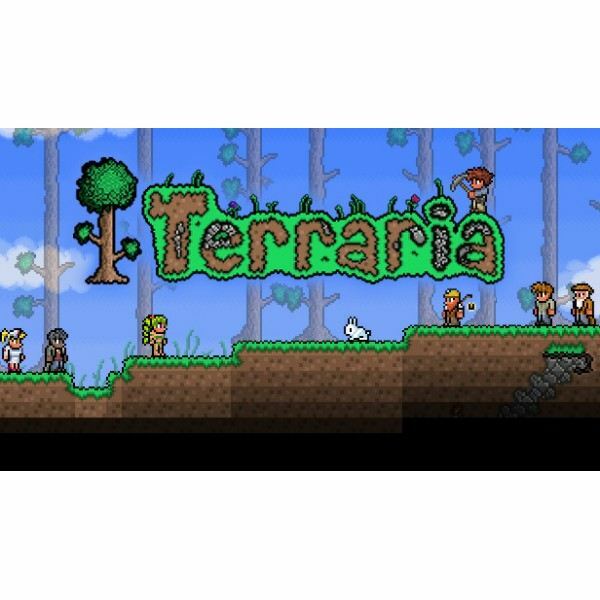 These are the basics of creating a shelter for your first night in Terraria. If you follow the steps above, you will be safe. Of course, during the night you may want to do something besides stand around. Your best bet is to start digging down to create a mineshaft. Make sure you have extra torches before you do this. Enemies won't spawn inside your mineshaft unless you run into a dungeon down there, so this is a relatively safe way of spending your time.